This series meets Tuesdays, April 16 and 23 and May 7, 14, 21 and 28. Here’s what’s difficult about talking about Israel: The simple questions are too simplistic and the complex questions give you a migraine. To whom does the land belong (and what does “belong” even mean)? What are narratives of the other that we haven’t learned, and what is true? What is fair criticism of Israel, and what is anti-Semitism? What right do Americans and Diaspora Jews have to wade into the conversation in the first place? The Hardest Conversation is not debate club. If you’re coming to pontificate, please stay home. If you’re coming to argue that you’re right, that others are wrong, and that it’s immoral even to listen to someone with a different opinion, this isn’t your class. But if you’re coming to learn, hear, understand, and discuss—this series was made for you. We’re going to learn as much as we can, from multiple perspectives, gaining knowledge and having uncomfortable discussions. We’re going to study all of the words that get avoided in polite conversation: BDS, terrorism, anti-Semitism, Nakba. We’re going to talk about AIPAC and JStreet and Jews and money. Palestinians will speak about the Palestinian perspective. Settlers will share theirs. The Sixth & I rabbis will teach, mediate, answer questions, and help you process. The presenters in these sessions won’t agree with each other, and they’re not going to pretend that they do. But the point isn’t to prove who’s right, or to demand loyalty to an ideology: it’s to learn more about a subject close to many of our hearts, consider who’s fighting with whom, understand what the words, ideas, and slogans mean, and grasp what’s at stake. 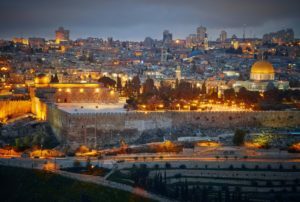 Israel—the place, the idea—has played a significant role in Jewish history. We yearned for a return to our home—but for what reason and in what way? This first class will explore the ideas of philosophers, activists, poets, and religious leaders who proposed sometimes radically different understandings of what a Jewish state could look like. Explore the history of both Jewish and Palestinian national aspirations and their contrasting experiences of modern Israel’s founding in 1948: what Jews have understood as a return from exile, and Palestinians as the Nakba (“catastrophe” in Arabic). Discuss the ways competing historical narratives impact Jewish and Palestinian identities today, how they shape politics, and whether mutual recognition of these narratives might help pave a peaceful path forward. After a pivotal 1967 war, Israel gained control of East Jerusalem, the West Bank (also known as Judea and Samaria), and the Gaza Strip. There are now nearly 450,000 Israeli Jews living alongside 2.8 million Palestinians in the West Bank – some for ideological reasons (religious or political), others simply because the cost of living is lower. Depending on your identity and perspective, this reality alternately presents a moral offense, a humanitarian crisis, an acceptable status quo, a necessary evil, or an affirmation of God’s plan for the Jewish people. Deepen your understanding of competing perspectives on Israeli administration of these areas through a facilitated discussion that will cover settlements, checkpoints, refugee camps, and the separation barrier. Since its inception, Israel has been repeatedly attacked, and has existed under frequent threat of attack, creating a perception of near-constant existential threat. Learn how Israel has responded to these threats over the decades, how they impact military decisions and ethics, and how the U.S. and Israel’s security relationship has evolved. Session 5: Who are the Jews? Who are the Palestinians? For as much focus as there is on outward political and military conflict between Jews and Palestinians, there are perhaps even more internal disagreements and divergent views within each community. From Fatah to Hamas and the Muslim Brotherhood to Palestinian Nationalists; and from Bayit Hayehudi to Meretz and AIPAC to JStreet, unpack the varied stances of Jews and Palestinians from across political, geographic, religious, and other divides. Session 6: Where do we go from here? Our sessions have thus far covered antiquity to modern history to today, but where do we go from here? Reflect on your own connection to our expansive conversations, while learning about contemporary movements advocating for the betterment of Israeli and Palestinian societies.